Car Photo of the Day: Family Photo, Mystery Car. An irony of the art of photography is that it captures moments in time with amazing detail of objects, but without any information much less detail on subjects. Nowhere is that so well illustrated as the photo above. I was having a conversation with a friend at work about family histories. He showed me several photos that he had collected of various members of his family, many he had never even met. One such photo is this one, which he knows is an uncle, and it was taken sometime in the mid-20th century in California. Beyond that, he knows little. Nothing about the woman. I said to him that I bet I could help him narrow it down to a specific year, based solely on the newish looking car behind the subjects. I told him I have a bunch of readers who are excellent car spotters. Let us know what the pictured cars are and we’ll at least fill in some blanks. My guess is a 1941, or perhaps 1946-7 Pontiac. Your best bet to date the photo is going to be the plates. Looks like a single-year plate with the 19 on one side and the specific year on the other (below the number). Looking at Wikipedia, I don’t see anything jump out from the 40’s. 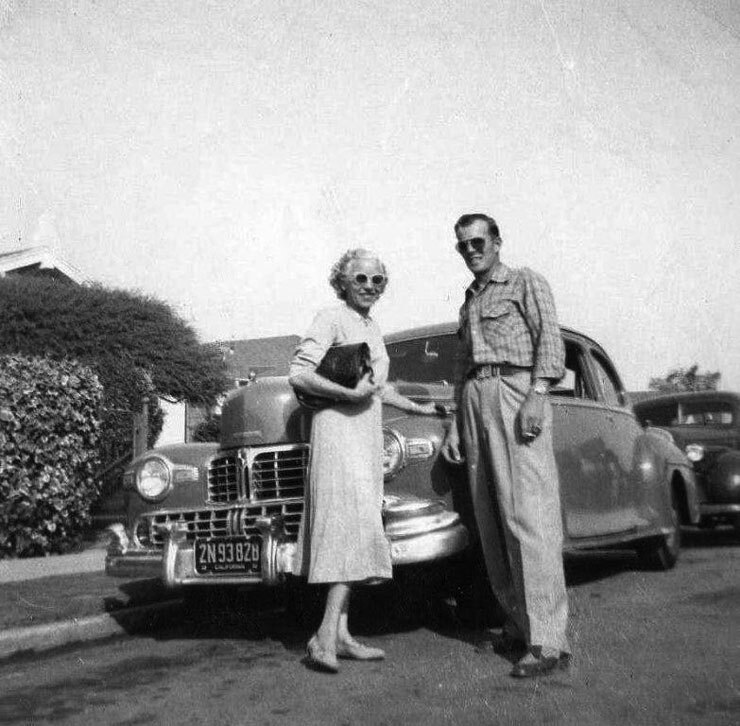 It is *definitely* a ’46 to ’48 Zephyr: My ‘rents had a ’48 continental and a ’47 Zephyr for parts. That ‘face’ is definitive for the cars! Not a Pontiac or ’42 Continental – the grille is wrong for the indian, and the conti body was smaller. There is a photo on Google of a supposed 1942 Continental with this nose, but it’s wrong IMO. I agree that it’s a 46 to 48 Zephyr. The grille, upright hood, and body are perfect. I’ll go further and suggest a 1948 based on the creases over the rear wheels, which I don’t see on the ’46 and ’47. That looks like a 1951 California plate to me – rounded corners, year numbers down below the main number. I think this really places the photo in 1951. Next Next post: Keep Clam – and a Spicy Chicken.